The fine art of senior living in Cromwell, CT.
Classic charm and comfort in the Hartford area. If you’re looking for exceptional senior living in the picturesque countryside of southern New England, you’ll discover it at Covenant Village of Cromwell, near Hartford, CT.
Cromwell combines village charm with convenient access to cultural attractions like the Hartford Stage, the Bushnell Center for the Performing Arts and landmarks like The Mark Twain House & Museum and the Harriet Beecher Stowe Center. City-lovers also will appreciate our convenient location, halfway between Boston and New York City. Nature fans will enjoy our convenient access to parks, walking trails, and championship golf courses. For the lifelong learner, nearby colleges and universities offer endless opportunities for acquiring knowledge and keeping your mind sharp! Covenant Village of Cromwell offers an array of stunning apartment, patio and cottage floor plans. Residences feature a patio or balcony and are built into a hilltop to create gracious, multi-level, interconnected neighborhoods. 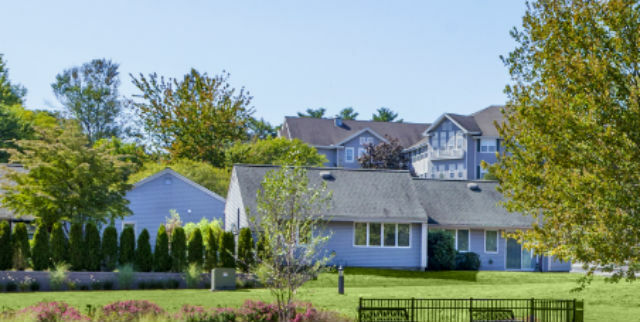 Our Photo Gallery and Floor Plans will give you a taste of the fulfilling Independent Living that can be yours when you make your home at Covenant Village of Cromwell. But, to truly experience the unlimited potential of your ideal, worry-free and maintenance-free retirement as part of our exceptional community, we invite you to schedule a visit and see for yourself!